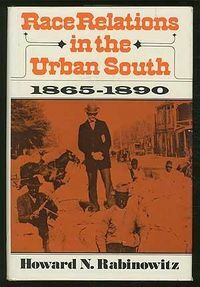 Race Relations in the Urban South: 1865-1890 traces the origins of segregation and the conceit of “separate but equal.” Rabinowitz finds that the influx of emancipated slaves into southern cities created new frictions among white Democrats, white Republicans, and newly-freed blacks. Segregation offered an uneasy compromise between the three parties. White Democrats sought new ways to control blacks instead of slavery. Republicans strove to balance their appeal to white voters with a degree of support for blacks. Burgeoning black communities looked for whatever social and political gains they could find, and many viewed separation as an improvement over exclusion. “Separate but equal,” however, offered much more in theory than practice, and, by the end of the nineteenth century, most of what blacks gained during Reconstruction had been reversed.